Simply the best GoPro, ever. Performance dialed. Capture incredible 4K video that's as stunning as the moment itself. HERO5 Black is waterproof, durable and made to go where your smartphone can't. Take hands-free control of your GoPro using simple voice commands. Capture clear, stabilized video whether you're shooting by hand or using a GoPro mount. Simply the best GoPro, ever. Performance dialed. Capture incredible 4K video that&apos;s as stunning as the moment itself. 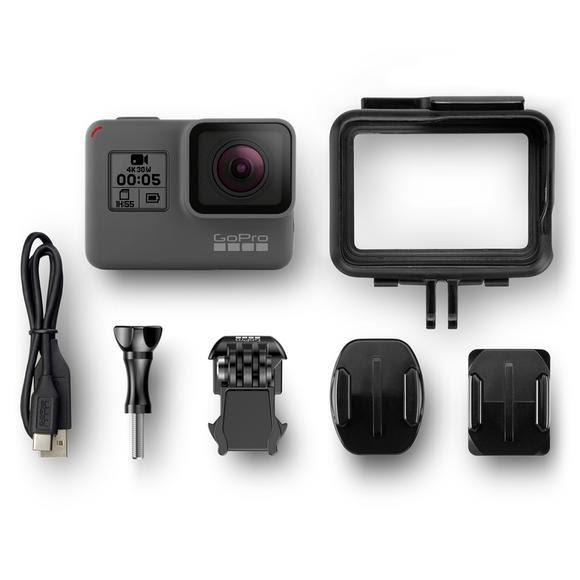 HERO5 Black is waterproof, durable and made to go where your smartphone can&apos;t. Take hands-free control of your GoPro using simple voice commands. Capture clear, stabilized video whether you&apos;re shooting by hand or using a GoPro mount. Frame the perfect shot and check out your photos and videos on the 2-inch touch screen. Get the shot then kick back as your footage moves to the GoPro app and transforms into an awesome video - automatically.